Baby fish (larval fish) are hooked on plastic, specifically microplastic particles, which stunt their growth and significantly raise mortality rates. The developing juvenile fishes, scientists from Uppsala University in Sweden found, only ate microplastics when given the chance and ignored their natural food source – free-swimming zooplankton. Microplastic particles are particles that are smaller than 5 millimetres in size. They originate from plastic waste products that break up into smaller fragments, or from microbeads in personal care products and other microscopic manufactured items. These tiny plastic waste particles reach our oceans via waterways and lakes, and build up to high concentrations in the sea, especially in shallow coastal areas. Marine biologists and ecologists are becoming increasingly alarmed at how much plastic there is in our oceans, and what the effect is and will be – because they accumulate – on marine ecosystems. We have known very little about the impact of microplastic particles on marine life, that is, until now. 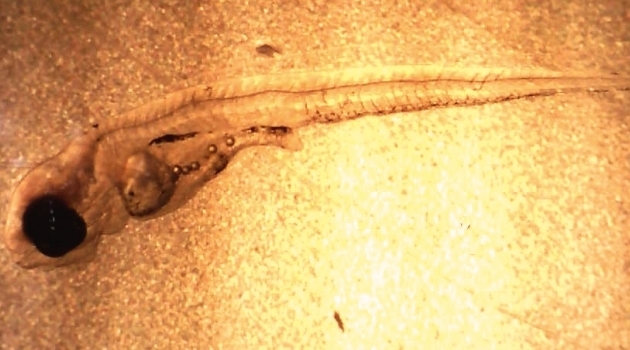 Oona M. Lönnstedt and Peter Eklöv explained in the journal Science (citation below) that for the first time, they have now been able to show that the development of larval fish is undermined by microplastic pollution. The researchers found that larval perch exposed to environmentally relevant concentrations of microplastic polystyrene fragments had clear signs of stunted growth rates. They were surprised to observe that larval perch would only eat plastic and ignored free-swimming zooplankton – their natural food source. They also found that larvae exposed to microplastic particles were considerably less active than their counterparts that had been reared in plastic-free water. The juveniles that were exposed to plastic did not react to the smell of predators, unlike the larvae in water that contained no microplastic particles, Dr. Lönnstedt explained. By not responding in an antipredator way, the larvae were more vulnerable to predators. When perch that were exposed to microplastic particles were placed together with pike – a natural predator – they were caught and eaten over four times more rapidly than the other fish. In fact, within forty-eight hours all the fish exposed to microplastic particles had been caught and eaten. Are plastics damaging fish populations? If this response in perch larvae translates to higher rates of mortality resulting from increased predation risk in nature, there could be direct consequences for the replenishment and sustainability of fish populations across our oceans. The authors say that their findings highlight the ecologically significant and previously underappreciated effect of microplastic particles that contaminate marine ecosystems. We urgently need new management strategies or alternative biodegradable products to reduce microplastic marine pollution. What would our reaction be if certain types of junk food made our young children grow less, become less active, and walk directly into oncoming traffic when crossing the road? More than ninety percent of Britons support banning the use of microbeads, a recent Greenpeace survey found. The survey showed that eighty-four percent of UK consumers would be put off purchasing goods from a company if they knew it was extensively polluting our seas. Microbeads, typically made of polyethylene, and also polystyrene and polypropylene, are minuscule microspheres that are used extensively in cosmetics as exfoliating agents, as well as toothpaste and other personal care products. Microbeads that originate from personal care products are washed down the drain and pass through the filters of sewage treatment plants. They end up in canals, rivers, lakes and the sea. They can remain in the environment for up to fifty years, and accumulate into dangerously-high concentrations. Billions of microbeads find their way into our oceans each day. They represent a serious and growing threat to marine life in general, scientists say, and the survival status of many endangered species. About eight tonnes of plastic waste ends up in our oceans annually. The global plastic waste problem can come back to haunt us when we consume fishes that have eaten microbeads. Citation: “Environmentally relevant concentrations of microplastic particles influence larval fish ecology,” Oona M. Lönnstedt and Peter Eklöv, Science Vol. 352, Issue 6290, pp. 1213-1216. DOI: 10.1126/science.aad8828. Video – Are microplastics in water becoming a macroproblem? You might not be able to see microplastics, but they are in our water. Plastic waste breaks into smaller and smaller pieces in the ocean until it is smaller than 5 mm in size.